Tip: Shake the phone to clear the signature. The signature shows up on the email receipt and helps Square detect and prevent fraud. When implementing the Android client, we started off with the simplest thing that could possibly work: a custom View that captures touch events and adds the points to a path. We addressed these problems in two different ways. drawing blocked touch screen sampling. Luckily, neither case turned out to be true. We soon discovered that Android batches touch events. Each MotionEvent delivered to onTouchEvent() contains several coordinates captured since the last time onTouchEvent() was called. 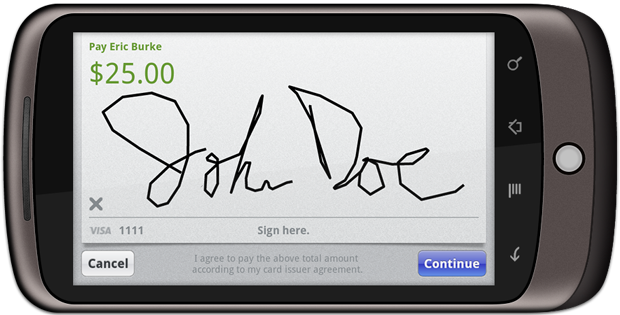 To draw a signature smoothly, we need to include all of those points. // the event will contain a history of those skipped points. // After replaying history, connect the line to the touch point. For each call to onTouchEvent(), SignatureView draws line segments between the touch coordinates and invalidates the entire view. SignatureView instructs Android to repaint the entire view even if a small percentage of the pixels changed. invalidate rectangles around the most recently added line segments dramatically improves performance. Create a rectangle representing the dirty region. Set the points for the four corners to the X and Y coordinates from the ACTION_DOWN event. Pass just the dirty rectangle to invalidate(). Android won’t redraw the rest. The improvement to responsiveness after this change is immediately evident. 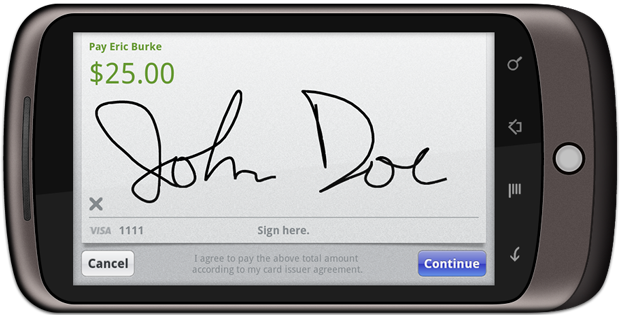 Utilizing the intermediate touch events makes the signature look much smoother and more realistic. Improving drawing performance by avoiding unnecessary work increases the redraw rate and makes signing feel much more responsive. * Optimizes painting by invalidating the smallest possible area. // Repaints the entire view. // There is no end point yet, so don't waste cycles invalidating. // Start tracking the dirty region. // event will contain a history of those skipped points. // Include half the stroke width to avoid clipping. * Resets the dirty region when the motion event occurs. If you want to try the real thing, download Square from the Android Market. If you read this far, Square is hiring.